Typhoon Chedeng has been been downgraded into a tropical storm, according to the latest bulletin issued Saturday by the state weather bureau. PAGASA reported that as of 4 p.m. on April 4, the center of the storm was spotted 340 kilometers Southeast of Casiguran, Aurora, packing maximum sustained winds of 115 kms per hour near the center and gusts of up to 145 kph. Tropical Storm Chedeng is forecast to move West Northwest at 20 kph. 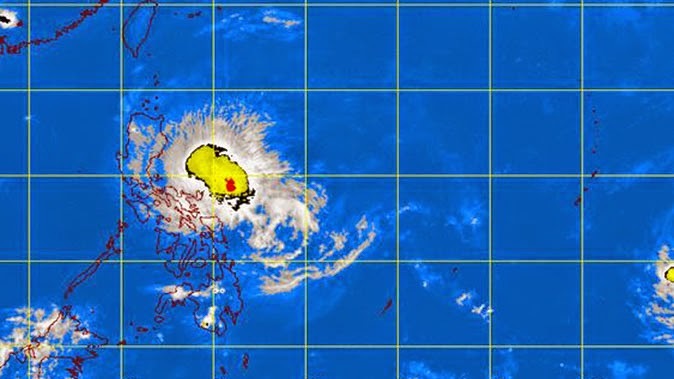 It is expected to be in the vicinity of Malibcong, Abra on Sunday afternoon and 445 km Northwest of Laoag City or outside the Philippine Area of Responsibility (PAR) by Monday afternoon. Residents in low-lying and mountainous areas are alerted against flashfloods and landslides. Large number of nipa and cogon houses partially or totally unroofed and old galvanized iron roofs may roll off. These areas will have stormy weather with heavy rains. State forecasters said the estimated rainfall amount is from moderate to heavy within the 150 km radius of the tropical storm. Residents in low lying and mountainous areas of the provinces with storm signals are alerted against possible flashfloods and landslides. Fisherfolks are advised not to venture out over the northern seaboard of Luzon and eastern seaboard of Bicol Region. Sea surface waves of up to 6-8 meters near the center of Tropical Storm Chedeng, PAGASA added.